Balance and proprioception retraining is an important component of the rehabilitation programs of most of our patients. But fit, able bodied pets can really benefit from this too! Just like us going to the gym, balancing on wobble boards, sitting on fitballs and peanuts, or even standing on one leg, to improve our awareness of our body and assist in injury prevention, our pets can perform similar exercises, modified to account for them being on four legs. These exercises can also provide mental stimulation and engagement, and most dogs really enjoy them, particularly if there is a great reward at the end. If you have a sporting dog that particupates in flyball, agility, lure-coursing or the like, you should make balance and proriocetion training part of their weekly exercise routine. Check out this video of balance and proprioception training in a dog who is super clever and very body aware! 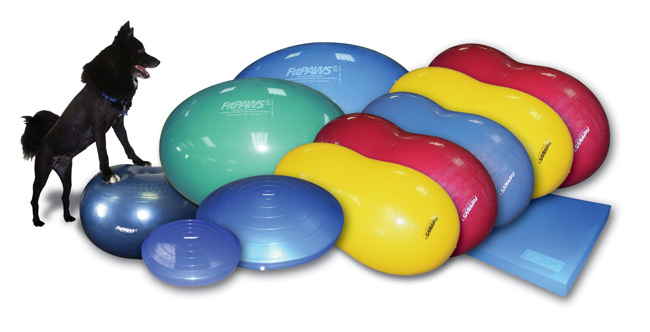 We stock a whole range of equipment from fitPAWS for purchase so you can set up some exercise routines for your dog. Please note that if your dog has had an injury, illness or surgery, your program should only be devised by one of our animal physiotherapists. Tags: Animal Physiotherapy, Animal rehabilitation, Balance and Proprioception Training | Permalink. Will my dog’s muscles go back to normal by themselves after injury or surgery? Wheelchairs for Dogs: When should you consider one?